When Margaret Bloom, author of Making Peg Dolls, shared with me she was working on a new book, I knew the second in the series would be just as wonder-filled as the first and I was right. I'm completely enamored with Making Peg Dolls & More. It possesses all the same fine qualities and is guaranteed to inspire creativity with its diverse projects for hand making even more adorable toys and gifts with wood, paint and wool felt. This newest book is divided up into three sections for projects along with many pages devoted to technique, materials, a photo-illustrated stitch glossary and a peg doll "doodle page" to help children, and you, sort out your design before getting started. Here is a brief recap of the project categories. I'm not listing everything you'll learn to make because, well, because I have to leave something for you to discover yourself! Simple Projects - a colorful toddler toy and brand new ways to decorate wood peg dolls for quick little gifts as well as ideas for incorporating them into family and seasonal celebrations. Toys that Spin & Fly has marionettes for play including a fantastic felt dragon that can carry passengers! There are also spinning tops, endearing mobiles and more. Herbal Comforts & More Sewing Projects - a rainbow of seven soft herbal-scented comfort dolls each with a unique appliqued design, a wonderful peg doll-topped pin cushion which I am definitely making, a sweet dream pillow and peg doll dream companions, a very cute gathering bag, and one of my favorites, clever interactive wall hangings complete with little openings for the accompanying peg doll characters to nestle in after a day of imaginative play. I just have to mention something I really appreciate about Making Peg Dolls & More. Each project has Small Helping Hands tips from Margaret with specific suggestions for ways to involve children of all ages in the making of the toys and gifts thus encouraging families to craft together. I can see this being particularly helpful for parents and caregivers because once the youngsters see what you're doing they'll want to join in! Did you know? All these lovelies are made with our own Holland 100% Wool Felt? Using this exceptional material makes all the difference in the sewing experience for you and for children. The felt is soft and does not annoy your hands and is just the right weight for cutting and sewing little things and for little ones to cut and sew. To help get you started, we're running a special limited time offer so look below for how you can save on our Holland Wool Felt and Wood Peg Dolls or get some for free when you buy the book! Save and Get Free Things! shopping cart to apply and see the discount. 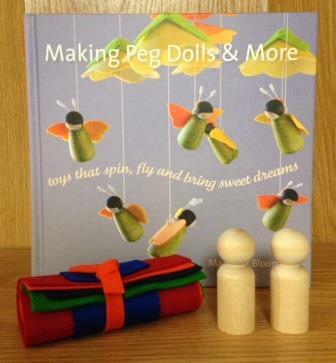 Order Making Peg Dolls & More and receive free things. A mini-bundle of wool felt + 2 large peg doll blanks.